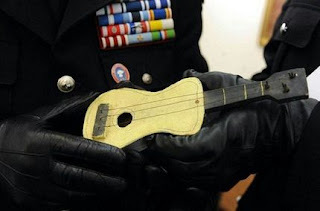 Carabinieri police in Rome have recovered a rare miniature guitar art piece by Pablo Picasso. Dubbed the 'Little Guitar for Paloma', Picasso painted the work yellow, gray and black and presented it as a gift to the daughter of his friend, Italian artist Giuseppe Parisi. The guitar remained with Parisi for more than 40 years. But two years ago, at age 92, Parisi was convinced to lend it to an Italian businessman who promised to build a wood and glass showcase for it to be exhibited at the civic musuem in Maccagno. The businessman instead kept it in a shoebox at his apartment in Pomezia, near Rome, and never returned it. When Parisi died in January 2008, his widow made a police report that the artwork was still in the hands of the businessman. The businessman has been charged with fraud and the artwork is set to take its rightful place in the Civic Museum of Contemporary Art at Maccagno, Parisi's hometown in northern Italy.